The Universal Law of Cause and Effect as it relates to cancer explaining the reality of where we are today. We have been led to believe that cancer strikes at random. That cancer somehow sneaks up out of the blue and takes down the most unlikely candidates. That we can catch cancer just like we “catch colds”. These are myths that strike fear into the general public. We don’t catch health either. Our health is earned. We do this by embracing a lifestyle that enhances our immune system and optimizes our health. We resist that which brings about an illness. The words above were recently posted on social media where it received a comment from a woman who actually has cancer herself. She was offended by what was said. She felt we were blaming people for getting cancer. Here is my response to her comment. We don’t choose our parents or the culture into which we are born. We don’t choose the language we speak or the way we think or the way we behave. It is well-established that 95% of our minds are subconscious. This means 95% of our minds are unavailable to scrutiny. Just as we have “trains of thought”, so do we have “trains of behavior”. If someone were to ask us about our habits, appetites and our entertainment preferences, etc. we would be unable to answer much about it. We would be unable to tell anyone why we like something or how it came to be that we like something or prefer something. With this understanding of the human condition, it should be clear that “blaming” is not what is being expressed here but rather the universal law of “cause-and-effect”. In addition to having acquired language, thought patterns, behaviors, preferences, and appetites, we are also exposed to toxins. These toxins are in air, water and in our hygiene products as well as the clothing we wear. There is no “blaming”, but rather an effort to help us understand clearly where we are and then a suggested roadmap to where we would prefer to be. Our current lives are vastly different from our ancestors. They didn’t have to consider whether or not the food they ate was poisoned (“non-organic”). They didn’t have to choose which water to drink. Nor did have to worry about if the air quality was safe enough for our children to play outside today. The leading causes of death today are heart disease and cancer, whereas they were minor causes 100 years ago. Today 1 out 6 people alive on the planet will get cancer in their lifetimes and these statistics are even grimmer for countries in Europe, many Asian-Pacific countries, and the US. Cancer is not something that is caught like a cold, nor is health, we earn Health! And, although the cancer rates in 1900 we’re less than 5%, they had doubled in about 50 years. These changes are attributable to what is known as the “industrial revolution”. Currently in the United States, one out of two men and one out of three women will get cancer in their lifetimes. Today, 310 kg of toxic chemicals are released into our air every second. This results in approximately 10,000,000 tons or 21,000,000,000 pounds of toxic chemicals released into our environment every year. And, ‘no’… this is not a choice that individuals make. We are not blaming anyone, we are pointing out the reality of life today on planet earth. As a consequence of this reality, we are offering an alternative on how to live a life that consciously avoids being victims of this tragic set of circumstances. And, for those who have already been poisoned enough as to have been diagnosed with cancer, we offer an alternative to the standard approach of using purely toxic protocols. 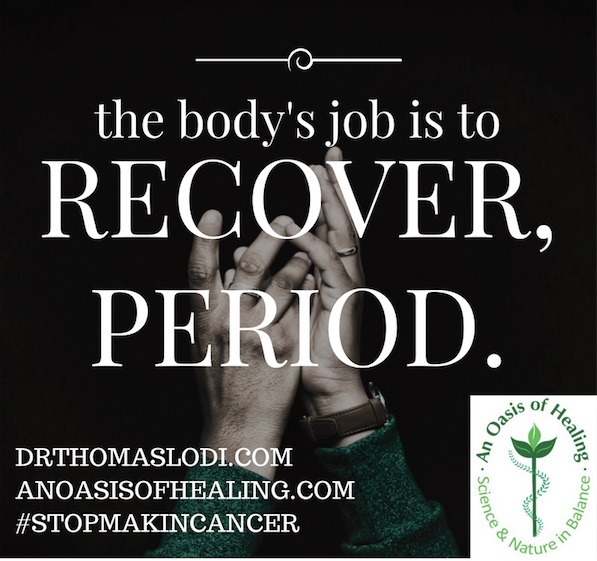 In addition to this and most essential to the program that we offer is a specific curriculum along with training on how to live one’s life in a way that minimizes the chances of getting cancer and allows those with cancer to stop the process, as much as is possible.